What kind of propulsion system does the ANSA spacecraft use? Q: What kind of propulsion system does the ANSA spacecraft use? A: So, back to propulsion systems... my thought on this is, during the opening scenes of the movie, we see Col. Taylor walking, yes, walking around the interior of the ANSA spacecraft. Not floating, but walking at one standard gee (1G) or near about of gravity. You will notice that Colonel Taylor is walking normally and not using handholds or exaggerated "This is what Hollywood thinks Zero-G movement would look like because I'm going reallllllyyyyy slow...." style of bad acting. Compare this to the Walt Disney movie "The Black Hole" where the crew of the explorer ship U.S.S. Palomino are in full zero gravity until they apply thrust or until the time that they dock with the U.S.S. Cygnus itself enclosed in an artificial gravity field. If Taylor's vessel was providing artificial gravity through thrust, then Taylor would be stuck to the rear bulkhead unable to move due to acceleration forces. However, looking out the forward view port, we find that Taylor's ship is moving very fast, we check ourselves on this fact by noticing how fast objective and subjective time is passing by viewing the Earth / Ship Time Clocks. While most would look right over this little fact, it goes far to explain what kind of technology we are dealing with in the movie. Taylor's walk, without effort, without the use of handholds or any other type of safety device, clearly indicates that, on top of everything else, the ANSA spacecraft (and ANSA) has a working artificial gravity generation system that doesn't rely on simple centrifugal force (rotation) to supply gravity for the crew! The ship has splashed down and is bobbing in the water at a 45 degree angle, yet when the suspended animation chambers open and the astronauts awaken, they react as if the ship were resting at a flat angle! The nose of the spacecraft is resting at a 45 degree or better angle skyward, yet when Landon hops down out of his suspended animation chamber, he doesn't fall at a 45 degree angle and land somewhere near the rear bulkhead, he falls straight, from the upper hibernation bunk to the floor, lands on his feet flat on the floor, loses his sense of equilibrium, and then sits down hard on Dodge behind him in the lower hibernation bunk. When Stewart doesn't respond, all three astronauts stand up (again, this would mean that they were standing erect at a 45 degree angle to the force of gravity as we know it), walk over to her chamber without any use of handholds, and peer in. With the ship lurching at a 45 degree angle, and obviously bobbing up and down in the water, the astronauts inside are unaffected by this exterior movement or the true inclination of the ship! This simply means that the command module has its own separate artificial gravity field generator that functions even when the command module is disengaged from the rest of the spacecraft. If we extend this gravity field generation to the exterior of the command module, then we can account for how the command module maneuvers while it is in the atmosphere and during reentry without any visible engines or exhaust nozzles, reaction control thrusters, etc. By selectively altering the force of gravity (Gs) from positive to negative along different X, Y, and Z coordinates of the spacecraft's flight path, the ship maneuvers as if it were under power. What I see as happening during the moments after the crash is that the gravity generator fails catastrophically, this is the loud sound that we hear right before the whole ship lurches and the astronauts are thrown around the interior of the vessel. The astronauts are tossed around like rag dolls because the artificial gravity generator fails and natural gravity instantly reasserts itself (returning the astronauts to a 45 degree inclination without warning or time to prepare for the change, they are taken completely by surprise). The failure of the artificial gravity field generator also creates a feedback that burns out the primary power cells and the ship automatically switches over to auxiliary power. Taylor reinforces this fact through his dialog in the movie. The explosion of the internal grav field generator weakens the spaceframe somewhat (possibly below the waterline) and water starts to fill the spacecraft through the ruptured seams which in turn causes the crew to have to abandon ship and watch it sink. Thus, it is clear that ANSA has a working and somewhat advanced technology of artificial gravity field generation and manipulation. The introduction and validation of contra-gravity opens up a whole new realm of possible interstellar propulsion technology! If you can generate artificial gravity, as obviously ANSA can and does, all you have to do is turn that artificially projected force of gravity sideways and voila! You have what scientists call "THRUST"! I'm postulating that the ANSA spacecraft are being powered by some type of gravity drive. Such a drive would generate a very powerful and specialized pseudo-magnetic field which would attach itself (using the ANSA spacecraft as a anchor point) to the fabric of the space-time continuum and would pull the spacecraft along with it. By creating a 'negative' vector of gravity, and a 'positive' vector of gravity, the two unequal polarities would work to attract each other, in essence, the ship would be attracted to the polarity of the forward flight vector, in essence, 'falling' faster and faster towards the unequal charged field effect. A gravity drive of this format would not be as brutally powerful compared to say a true nuclear fusion / plasma drive, but it would have one clear advantage that regular, more simple Newtonian reaction based drives did not, and in the realm of interstellar flight, this is a very big advantage: fuel. The gravity drive would only be fueled by electrical power, and that electrical power could come from a compact onboard atomic fission or nuclear fusion reactor. As long as the reactor had fuel, the drive could operate at peak efficiency, therefore the drive can have constant acceleration, another tremendous advantage! High density power cells would provide limited capacity to charge the generator, but would probably be drained rather quickly. Such cells could be mounted in the command module to provide a very limited grav field for simple maneuvering upon reentry, and perhaps to reinforce the structural integrity of the vehicle during landing thus replacing reentry thrusters and reaction control motors for basic flight. The command module clearly lacks any sort of physical evidence as far as proof of reaction control systems (RCS) goes and no amount of wishful thinking on the part of fans is going to make these nozzles appear magically on the film. There is clearly no evidence of engine exhaust nozzles ("bells"), roll jet quads, or attitude control thrusters (small thrusters that would control pitch, yaw, and roll, or up, down, left to right, right to left, and roll both clockwise and counterclockwise to you non-aerospace types). Given the lack of evidence of any type of Newtonian type propulsion system, we must assume that the vessel uses a non-Newtonian type of propulsion; a Hasslein gravity drive. This type of advanced propulsion would also allow the vehicle to 'soft land' by varying the speed through different G ratings of the fields and would maintain an interior artificial gravity field to prevent the effects of high G maneuvers on the astronaut crew until splashdown or such time as the generator was turned off, ran out of power, or somehow failed. Such an artificially reproduced gravity field might also absorb the basic kinetic force of impact, thus taking away the bone jarring splashdown or landing impact and reducing the need for such primitive technology as giant parachutes to slow such an advanced spacecraft. As we see no evidence of any recovery chutes being deployed, and the forward nose cone of the command module is heavily scored with reentry heat, we can infer that this vessel flies nose first through the atmosphere, as opposed to the Apollo command modules which fly backwards through the atmosphere and have a heat shield mounted on the lower hull to prevent their incineration. A gravity drive would also have impressive braking properties, it would be possible to slow the ship down very quickly. 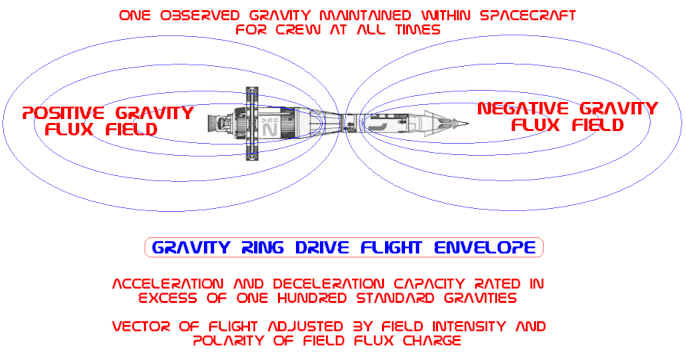 The range of the gravity drive would be effectively unlimited, limited only by the mechanical service record of the individual components, the power feed from the onboard reactor(s), and the life of the crew. Given a constant acceleration of several weeks, the drive could, theoretically, reach .9c or 90% of the speed of light and even beyond, a true ATSOL (Approaching The Speed Of Light) drive system. This technology would be an ideal drive system for ANSA to use on an interstellar survey and exploration mission as it would be highly efficient and economical with regard to fuel, which on a trip to Alpha Centauri and back, is going to be the primary concern of the mission. I think that the evidence of this advanced technology, as presented in the movies, is very concrete. Both Virdon's and Taylor's craft make some highly peculiar noises when they make reentry, both a high pitched 'warp drive' kind of spacey warbling noise that is not similar to any type of rocket propulsion in use then or now, leading to the thought that it must be a very advanced form of propulsion. Was Alan Virdon's ANSA spacecraft equipped with an advanced form of warp drive or FTL propulsion system? Possibly, see this link for discussion on that matter. For the time it would take for the ANSA spacecraft to accelerate to various POTSOL using the Hasslein gravity ring drive, consult this handy chart.